How to: Turn those toes out 45 degrees with feet a bit wider than shoulder-width apart. Place the kettlebell on the ground between both legs and begin to squat while keeping the core engaged, and grip the kettlebell handle with one hand. Then, using force from the hips, push through the heels to rise to standing, pulling the kettlebell upwards while the elbow drives up. Lower back down and switch arms. Shoot for 10 to 12 for each arm. How to: Here’s a new way to spice up those lunges. 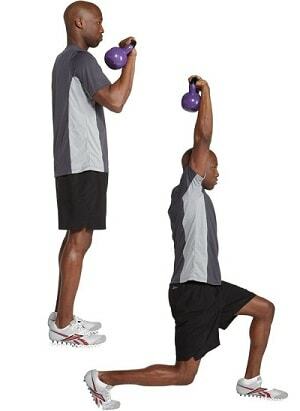 Stand up straight while holding the kettlebell in front of the chest with two hands, arms bent and palms facing each other. Lunge forward with one leg while raising the kettlebell overhead (raise the roof!). Return to standing while returning the kettlebell to the chest. Try for 10-15 reps on each leg. How to: We promise no wrestling is involved. Start with the kettlebell between the feet, set a bit wider than hip-distance apart. Grab onto the handle with both hands with the knees bent and hips back. Then, pull the kettlebell to the shoulders while the knees straighten and elbows rise. Remember: The force is coming mostly from the hips, the arms pulling at the very end. Keeping the core engaged the whole time, move the weight back down by the ground and repeat for 12-15 reps.
How to: Forget crunches. Sit with the legs bent and feet flat on the floor, about hip-distance apart. 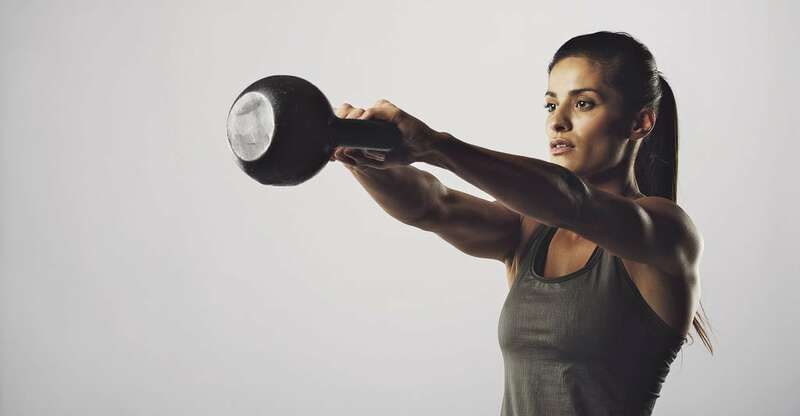 Hold the kettlebell with both hands at the chest, and then lean back to a 45 degree angle. Here’s the fun part: Rotate the torso from left to right by twisting at the waist and swinging the kettlebell across the body. See how many you can do, with perfect form of course! How to: Hold the kettlebell in the right hand and angle the feet 45 degrees away from the right arm. Raise the kettlebell overhead, lock the arm, and keep your eyes on the weight (which will help keep the shoulders aligned!). Shift your weight onto the right leg and begin bending forward at the waist. Keep the right arm extended overhead as the body bends forward and the left arm is pointed toward the ground. (For all you yogis out there, this should feel similar totriangle pose.) Lift back up slowly, staying in control. Repeat for 6 to 8 reps on each side.